It's coming up to that time of the year again when not only are race days (the most famous being the grand national) starting but garden parties, spring weddings and more are coming. They aren't here quite yet in Manchester as I did have to dodge snow showers while shooting these outfits. 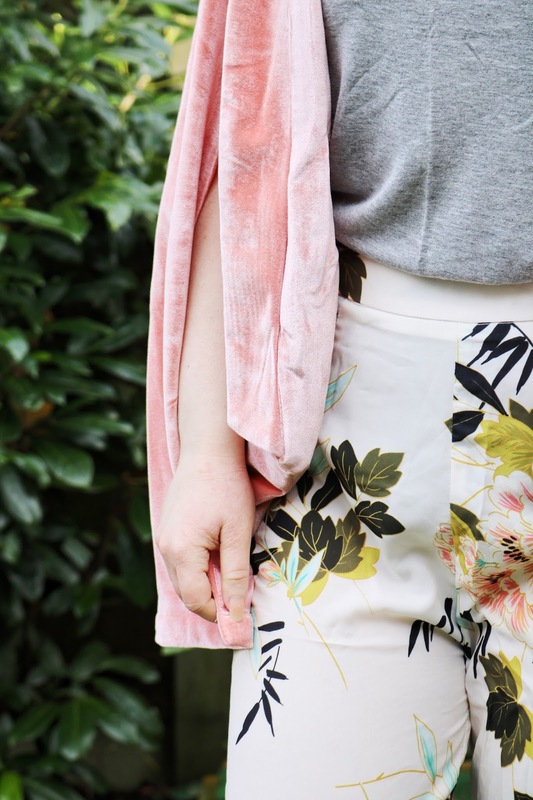 I'm working with the lovely people at Pretty Little Thing for this outfit post featuring ideas for various spring events that you might have coming up over the next few months. Now, if you've been following my blog or social media for a while, you'll know that both of these outfits are a little out of my comfort zone but I love them both. The most un-Heather item is this crushed velvet cape blazer...You put it on just like a blazer but it has deep slits down both arms so it is almost like a structured cape. I have a UK size 8 and it fits well on the whole but it is a little too large on me. I love the design, it's something very different to what I'd usually go for and the shade is gorgeous. I love blush pink all year round but especially during the spring months. I know that florals for spring isn't groundbreaking but they are pretty and great for a spring event! Next up is probably my favourite item and again something that's well out of my comfort zone in terms of the shades, fabric and design. Usually the most colourful I'll get is navy blue, burgundy or mustard but I do love all of these creamy, botanical and spring like shades! Now, I am ridiculously tiny at only 4ft 11 so these culottes are more of full length trousers (stop laughing!) but I still love how they look. I've never been a typical 'girly girl' who loves dresses and any kind of event, wedding or party struck fear in me as it would mean that I have to wear a dress but these are a great alternative as they're pretty, spring-like and formal. I do have one issue and it is that the fabric is so sheer therefore you do need a slightly longer jacket! However, I love the fit, the high waist looks so flattering and they're great for the upcoming spring/summer months. Note to self: Don't eat a huge plate full of pasta before you are going to shoot outfit photos! Sorry for the light in these photos, it was snowing on and off all day! Also please ignore the fact that I'm paler than Voldemort...Since losing a total of 24lbs (about 1.7 stone), I'm so much more confident wearing dresses, even bodycon dresses which was unthinkable at the beginning of last year! A little black dress is a wardrobe staple but I've never kept any over the years for various reasons but I think this one will be staying around for a while as it's little more unique, I love the length and frill neck line. I do have to be careful about what I eat in this dress as it isn't forgiving at all and food babies will be very obvious but I love the style, I love how simple it is and I think I'll get so much use out of it in 2018! Lastly is an item that I completely forgot to photograph and it's a gorgeous, minimal necklace. I don't usually go for gold jewellery but I think it's pretty during the spring months. Minimal jewellery is my go-to and this necklace is perfect - it isn't too long, it's lightweight and comfortable. What do you think of my race day outfits? Have you bought anything from Pretty Little Thing? Ooe I really like that pink jacket! How gorgeous is that blazer and those floral trousers! You look gorgeous babe! I love the first outfit - getting total spring vibes! 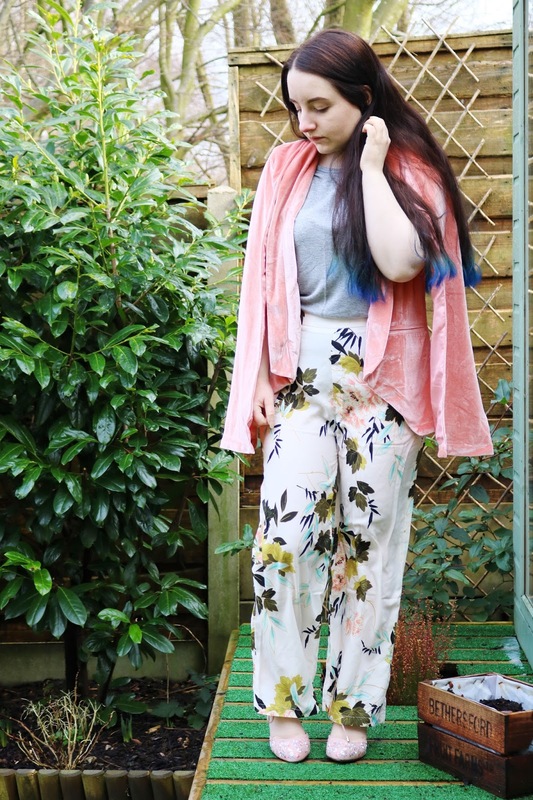 I love those floral pants! And I love how well the dress fits you, you look stunning! I adore those trousers - they’re something I could wear for work too ! those trousers look so good on you.